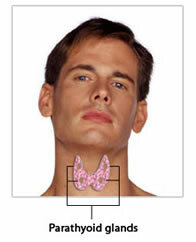 The Parathyroid Glands are small glands located in the neck, behind the Thyroid Gland. There are usually four Parathyroid Glands, two on each side of the neck; each gland is normally about the size of a grain of rice. The Parathyroid Glands produce Parathyroid Hormone, which helps to regulate and maintain an appropriate balance of calcium in the bloodstream and in tissues that depend on calcium for proper functioning. It is important to note that although the Thyroid and Parathyroid Glands are located next to one another and share similar names, they serve very different functions.